It is with great sadness the family announces the passing of Marie Ernestine McCormick which occurred at the Saint John Regional Hospital on Tuesday, April 9th, 2019. Born 1926, in Petit Rocher, NB, she was the daughter of the late Josie and Marie Ann (Frenette) Morrison. Ernestine was a homemaker who enjoyed quilting and knitting. 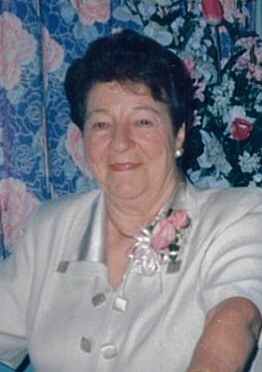 Ernestine is survived by her son Mike McCormick (Debra) of Kingston, NB; daughters Patricia Thompson of Kingston, NB and Nancy Fullerton (Terry) of Long Reach, NB; sisters Elva Daigle of Bathurst, NB, Esther Leslie of Gondola Point, NB and Martha Paul (Lloyd) of Saint John; special sister-in-law Marie Morrison; grandchildren Catherine, David, Mark, Jason, Shannyn, Stephen, Tara and Jim; 9 great grandchildren; as well as several nieces, nephews and friends. Besides her parents, Ernestine was predeceased by her husband Thomas, her son-in-law Allen, 2 sisters and 4 brothers. Arrangements are under the direction of Fundy Funeral Home, 230 Westmorland Road (646-2424) with visitation being held on Thursday, April 11th from 2 to 4 and 6 to 8 p.m. A Funeral Service will take place from the Fundy Funeral Home chapel on Friday, April 12th at 2 p.m. followed by an interment at St. Joseph’s Cemetery. Donations in memory of Ernestine may be made to The Cathedral Restoration Fund, Heart & Stroke Foundation of New Brunswick, or to the charity of the donor’s choice.